For over twenty five years, Kyle-Beth Hilfer, a Harvard Law School graduate, has been providing legal services to advertising, marketing, promotions, intellectual property, bloggers, artists and new media clients. Her hallmark is her ability to integrate her client’s business goals into practical, innovative legal solutions. 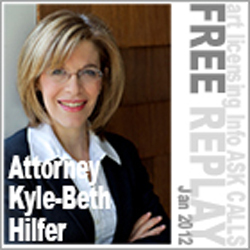 To shed some practical light and layperson language on touch legal questions, Kyle-Beth addresses copyright infringement, art licensing contracts, trademarks and copyrights, protection of your art, and relationships with licensees.